When lighting a candle for a personal candle spell or a ritual for thanksgiving of blessings received, the noises that may come from your candle may be an indication of an outcome, whether successful or not. In many of the Spiritualists Churches and its practitioners, the belief that candle noises such as ‘popping’, ‘crackling’ or ‘chirping’, can be used as a method of candle spell divination. Many times I have set in silence in front of my altar praying, conducting a reading for a client or deep in thought, and a candle will sputter, hiss or pop. I always pause and take note of the reason the candle was lit and what either was just said in conversation or what was in thought at the moment of the noise. Others divine that the noises from the candles are indicators of how well the spell is working. Some believe that the activity of the candle, including noises, will mean that your Guardian Angel or a Spirit is “working” on the situation for which you have lit the candle. Sometimes the noises are soft, but do not be surprised if you hear loud ‘pops’ as these are interpreted as vigorous work towards your goal. In matters of love, money and success, this is definitely a good sign you would want to welcome! Still others say that if you are burning two candles together for matters of love for instance, then the two candles are “talking it out” to either ‘reconcile’ or not and you may have to resort to adding other methods of candle divination to determine an outcome. 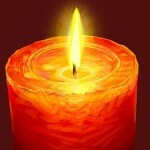 For matters of dark work such as revenge, reversing or using black candles, the noises may indicate the intensity of the “battle” between your objective and the opponents, as if in a “struggle”, or may indicate that your intended target has got a “heads up” on what you are doing and is burning candles or working magic against your work. Popping candles will indicate that you may have to “ramp up” your attack. For candles that shatter or crack their glass holders, the intensity of the “breaking” of the spell will be indicated by the intensity of the break. I have had the 7-day “Novena” type candles in glass break so hard that my daughter heard it through her closed bedroom door on the second level of my home. Good thing she woke me up as I had a red St. Michael candle break right in half across the middle of the container and I had only an inch left in the candle to be burned and no flame was touching the glass. This was a sure sign that the candle took a “hit” for the client and diverted a stream of negative attack from an enemy. Spending time with your candle and listening to the language that it speaks to you and the insight you gain from your thoughts while in meditation is a great way to understand the meaning of the outcome of your candle spell or ritual through the behaviors of your candles.